Two world-renowned lighting companies have announced a strategic partnership aimed at creating the next generation of lighting for on-the-go content creators. 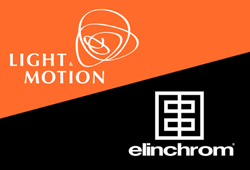 Light & Motion and Elinchrom, notable brands pushing the boundaries of professional lighting, have announced a technical collaboration two years in the making. Known for providing photographers premium lighting solutions including a collection of world-class light shaping tools, Elinchrom has become an iconic brand in the photographic world. Light & Motion, one of the most forward thinking LED light manufactures, have brought their game-changing technology to the broadcast and video world with the peerless Stella line – a collection of ultra-portable, powerful, robust continuous lights. The synergetic relationship between the two companies is an exciting development for the ever-expanding world of on-the-go content creators requesting lighting solutions that are reliable, compact, and time saving. The timely announcement of the Light & Motion and Elinchrom partnership comes with their first collaborative release of the Stella Pro 5000 RF and Stella Pro 8000 RF. These powerful, portable, and cord-free daylight balanced lights from Light & Motion now add complete wireless control thanks to the addition of the Skyport® Protocol from Elinchrom. A new Elinchrom Skyport® Remote Control for Stella was also released to conveniently manage the lights’ settings from alongside the camera/monitor, in any environment, allowing content creators everywhere to work efficiently in ways never before imagined. This alliance, by extension, also includes Sekonic as select light meters, including the new flagship Speedmaster L-858DR-U meter, containing Elinchrom’s Skyport® Protocol can remotely control the new Stella Pro RF lights. The teams at Light & Motion and Elinchrom are already hard at work on their next offerings. Both Elinchrom and Light & Motion see their collective and individual strengths marrying to bring forward-thinking solutions to the converging worlds of photography and video, particularly as end users grow increasingly comfortable creating in both. "As kids we were taught to play nice in the sandbox. Now, we are aiming to totally redefine the sandbox,"
Beyond bright, we are Powerful, delivering remarkable output from some of the most innovative, lightweight lights on the market, lights that deliver certified high TLCI and high CRI in a daylight or Tungsten balanced head. We are Portable, making the most com-pact easy-to-use lights in the industry. We are Progressive, one of the few lighting brands to design and build our products in the USA and the only brand to certify our products to the rigorous FL-1 Standard. Light & Motion products come with a 2-year enhanced guarantee. We have been recognized for our pioneering business practices and smart carbon footprint through numerous environmental awards, including the US Commerce & Trade Research Institute’s 2015 California Excellence Award recipient. For additional information, please visit http://www.stellaprolights.com. Since 1962, Elinchrom has been producing the world’s most portable lighting gear, drawing from a heritage of more than 50 years of innovation. Based in Renens, on the shores of Lake Geneva, Switzerland, Elinchrom continues to innovate with a product range that covers every photographer’s needs, from compact flash equipment to battery and power pack systems, reflectors, softboxes as well as numerous lighting accessories. Elinchrom’s lighting equipment is used around the world for both studio and outdoor purposes. For additional information, please visit http://www.elinchromus.com. MAC Group is a sales, marketing and distribution company dedicated to supplying photographers, videographers, educators and students with the world's finest image-making tools, education and inspiration. For more information on the MAC Group, please visit: http://www.MACgroupUS.com.